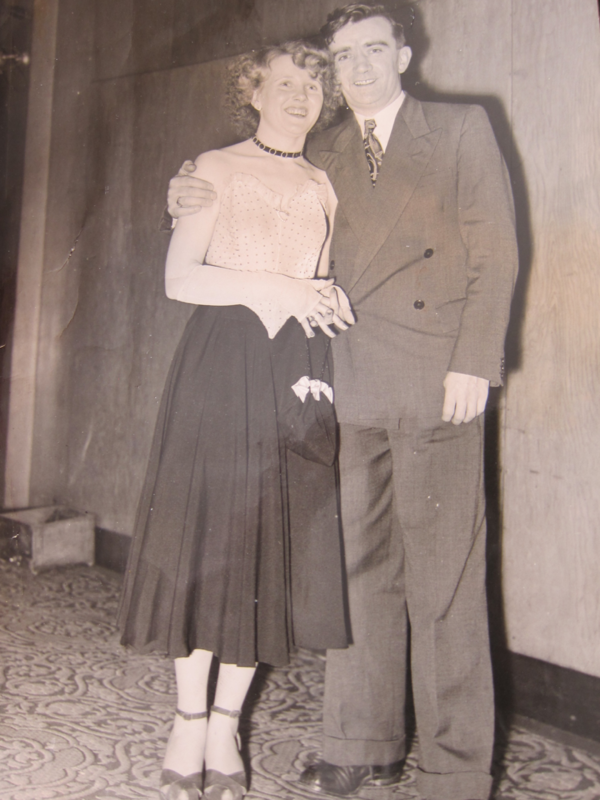 Rita Armin’s husband Henry served in the British Army during the Second World War. He sustained severe injuries after a botched parachute jump, leaving him disabled for the rest of his life. He died in 1998. Rita describes how she met Henry and their happy marriage, including the birth of their son Philip. She outlines the struggles to receive financial and practical support while Henry was alive. Rita talks about her successful career working for British Airways, her current role as an award-winning Police Service Volunteer, and her love of travel. This interview was conducted by Ailbhe McDaid on 27 February 2017. It is Monday, 27th February 2017. Conducting an interview for the War Widows’ Stories project. An interview with Rita Armin conducted by Ailbhe McDaid. For the record, can you state your name please? My name is Rita Mary Armin, but people call me Rita Armin. So can you tell us a little bit about your life at present … what you do? You mentioned you work for the local police force. My life at present, well it’s a pretty busy one actually. This week I will be working two or three days at the local police headquarters in Stockport, I’ve done this job, I’m a PSV, which is a Police Support Volunteer, and I’ve done it for, this is my seventh year, seven years in May, I volunteered obviously seven years ago, and because I have shorthand and touch-typing skills I was snapped up, and I use these skills quite a lot. Tuesday and Thursday this week I’ll be minuting meetings which are called Ward Level meetings. So it can be quite a lively meeting lasting for one or two hours so I finish those and come out of those armed with loads of notes and I’m able to type those up and then I float [email] them out to various people, usually the same day, and then that’s ok for another month, so they’re monthly meetings. Now and again we get calls from head office. They want volunteers to do this and do that, and apparently I’m quite good at persuading people to be volunteers for the police, so I did this one day at Manchester University and got ninety volunteers. Don’t know if they were all suitable, but the next day they had a day at MMU [Manchester Metropolitan University] without me, and they got no volunteers! Perhaps it was just a bad day. 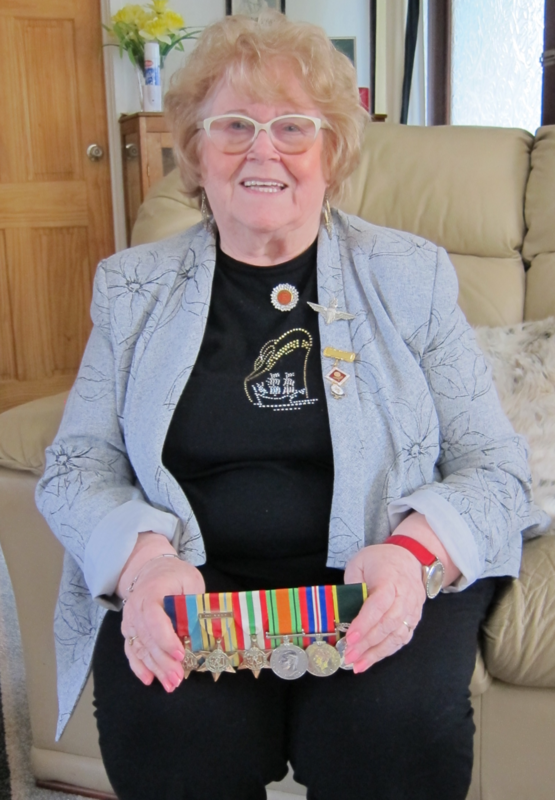 So yes, it keeps me busy, but I also do quite a lot for the War Widows’ Association, and if there is anything coming up, like the AGM, I will be going to that to support the new Chairman, who is a wonderful lady. I’ve never met her but I feel as though I really know her because we’ve just emailed each other so much and she’s pretty good. That’s Mary Moreland. Right, so here we are again, my main job before I retired was working for an airline. Am I allowed to say which one? The best: British Airways. I started off as a secretary and I worked there for nearly thirty years, and it was decided that I’d got ‘too many brains for a secretary’, so towards the later years I became technical, looking after two-engine airplanes which were just being introduced. My main job was on the ground-to-air-radio, had to speak to aircraft that were coming in with problems, and they call in; they call in to air traffic and they call into British Airways Ops [Operations] to say so many ‘souls’ on board, and then they speak to me, saying “B-Tec Manchester, we’re fit”, or “we have a problem on this airplane”, and that’s where I come in with my shorthand cos I’m able to take down every word that the pilots say. The first day I was doing this they’d never had a woman do the job before and they called in and I said, “B-Tech Manchester, can I help you?” and they said “That’s a woman! That’s Rita!”, because at one time I had worked with the pilots, you see, so I know all the ones who were based at Manchester. So yes, I went on from there and I absolutely loved that job, but I had to retire early because my husband became very sick and he needed, you know, full-time care. But I’ve also worked as a volunteer for Christie Hospital, and that was under the umbrella of the Red Cross, and I was doing therapeutic care there for a few years, but that could be very sad. I’d really get to know somebody, and then I’d lose them, so it was getting to me. I had to look for something else because I don’t like just sitting at home. But apart from my job I have other things going, like travel all over the world. Fairly recently I’ve been to Brazil, Panama Canal, Guatemala, Mexico … Oh all over the place. Just a year ago I went over to Australia where I’ve been many times, but this time I visited New Zealand as well. I went on a cruise around New Zealand and it never stopped raining. Couldn’t go out on deck some days, but Australia was fabulous. I called in at Perth, as you do, and I stayed for a week there. I had some friends that I met in China, and they said, “If ever you’re near Perth, you must call and see us”, and I said, “Don’t say that because I turn up!” Anyway, I had a lovely time for a week and they’re coming over here to see me in April. I have a dear friend in Dallas, called Martha. I met her on the Panama Canal and she invited me to her place, and again I said don’t ask me cos I turn up and four months later I was visiting Dallas, and I had the most marvellous time. She was in an old folks’ home which turned out to be something like a six-star hotel. Well she had two cats and even the cats had bathrooms. So fabulous. I go there about once a year. I was there last year for her ninetieth birthday. I was her surprise. I didn’t jump out of a cake, but it was absolutely lovely. Lovely family … they make me very welcome. So yeah, in the meantime, apart from working for the police, I like the theatre. I have some very, very nice friends, mainly ex-British Airways, and we go about together and do all sorts of things. I was out with a couple of them only two days ago. One was from Macclesfield, and one was from Vancouver, so just your ordinary kind of lunch. I like the theatre. I love the theatre, and I like films. My favourite film star in all the world is Mr Tom Hanks. I think he is absolutely amazing. I got his picture with his signature on and I really want to meet him one day, and I’m a sort of determined person and I believe he has a house over here so … I’m not going stalking him or anything like that, but I’d really like to meet him. Well, hopefully that can come true for you! Can I take you back to your early life, Rita? Where did you grow up? Could you tell us a little bit about your family? Was there any military connection in your family before? Well I was a child during World War 2, so all my uncles, my brother, were in the forces. Dad wasn’t in the forces because he was on munitions. He was making mines, floating mines in the sea so, you know, he was allowed to stay at home. But my brother, who was seven years older than me, was evacuated with me at the beginning of the war in 1939, and at the end of the war, the last year, he was fighting for his country in Germany. Then after he came out he couldn’t settle down to his job and he joined the police and had a wonderful career in the police, became a police sergeant in no time at all. He did a grand job. All my uncles were scattered all over the globe. Uncle Harry wasn’t allowed to say where he was going, and then eventually we heard he’d gone to the Falklands. My mother’s geography wasn’t very good, and she told me it was somewhere off the coast of Scotland. Grandma butted in, who was bright as a button, said, “No it’s not, It’s off the coast of South America. He’s gone all that way and he can’t swim”. And Mother again said one of her little sayings that made us all laugh. She said, ‘Oh and he can’t ride a bike either”. And I have actually been in touch with the Falklands, because that’s on my bucket list, and hoping I might hitch a lift with the RAF over to the Falklands because I have worked for the RAF when I was with British Airways. They borrowed a couple of British Airways aircraft and I used to go down to [RAF] Brize Norton to see the engineer and sort out one or two things with him. But anyway, that’s another story. So as a child, I was six years old when war broke out and I can remember that as clear as anything. I think I was evacuated on the Friday, which would be 1st September, and I was sitting in my new home and Mum and Dad had come to see me on 3rd of September, and we listened to whoever it was [on the radio] who said that war was declared. I think it was Mr Chamberlain. So, I was away for quite a number of weeks, months, and very unhappy. We weren’t made very welcome in the area because the local kids could only go to school half the time because the evacuees were in the school the other half. They locked me in a shed in a field where there was a mad bull outside one day, but anyway, I was only evacuated to Hazel Grove, which is only about four miles from where I live now. But anyway, when the war was over, which was amazing, because we did see quite a bit of action where I live … I clearly remember the night of the [Manchester] Blitz, and quite a lot of people were killed just in the next road. 24 people killed in one house. They were having a wedding and even the bride and groom were killed. Just the father survived. And a landmine hit the house and a landmine used to come down in a sort of basket and that basket was found on the shelter where I was sheltering with my family. Anyway, when the war was over, I can remember we had two parties. First one when the war was over in Europe and then later on when the Japanese side of things stopped. We were very upset about the bombs, the atom bombs. And I have, in fact, visited … not Hiroshima, the other one … Nagasaki. I’ve been there and it’s so sad. I’ve been to Okinawa and visited all the underground shelters where the Japanese were committing suicide, hundreds of them … wouldn’t give up to the Americans. Anyway, when I was about 11, I did the 11 Plus in those days. I passed with flying colours. I was supposed to be going to the best grammar school in Manchester, and Mum and Dad said, “Well we can’t afford it so you can’t go”. The teacher came ‘round and the nuns came ‘round, but anyway they couldn’t persuade them. The school, which was a Catholic school, didn’t give up on me, and there was an exam going when I was 13, so they put me in for that and that was for a commercial college in Manchester called the Gregg School, and I came top out of 140 girls, and I won a free scholarship for 12 months and that’s where I got all my commercial skills. Shorthand, typing, book-keeping, French and, would you believe, horse-riding! But they couldn’t afford that. I got everything free except French and horse-riding, and they found me a job. I went to work for a company called Marshall Fabrics. It was all textiles in those days, mills and textiles, and I was working in the office. A lovely company, and I really enjoyed the job. Rita and Henry’s wedding. Corpus Christi Church, Miles Platting, Manchester. 29 May 1954. Rita and Henry, just engaged, after dinner at the Grand Hotel, Manchester. Christmas 1953. I worked there for nine years and met my future husband there, Henry. So I met him when I was fifteen, and I started to see him when I was about seventeen, and of course the family were in a, you know, a bit up in arms because he was quite a lot older than I was, but I just took no notice. 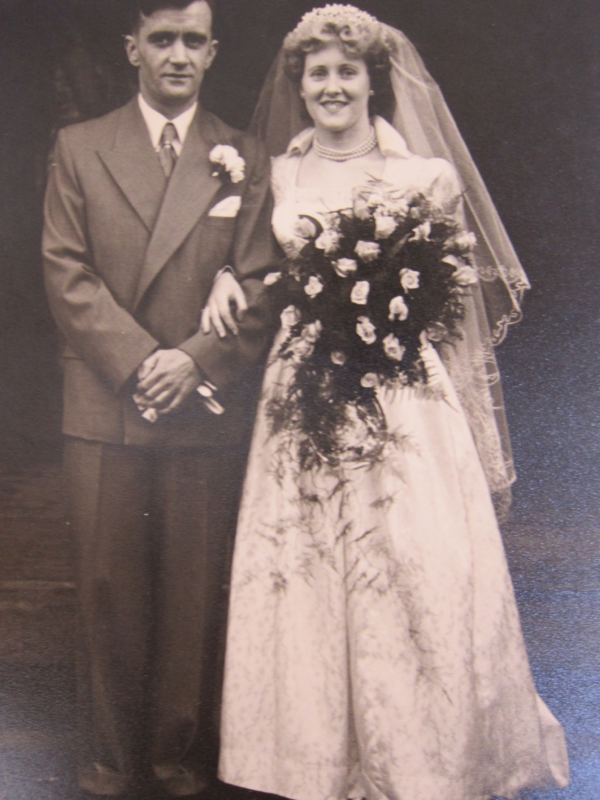 I’d made my mind up and so had he, and we married in 1954. I was twenty and he was fourteen years older, thirty-four. But he did tell that he was a ticking time bomb. Got this awful injury in World War 2. He was in the Parachute Regiment and he made a jump, well he jumped twenty-six times would you believe, but the last one was when he was badly injured because they shot holes in his parachute, dive bombers over North Africa, and his ‘chute of course didn’t hold him up, and he just crashed to the ground and landed on his heels and jarred all the way up his spine. Of course, he really damaged his spine, and he was taken into all sorts of different hospitals but … he carried a card with him that admitted him to hospital immediately to see this consultant called Sir Harry Platt. You might have gleaned that I’ve got quite a good memory, so I can remember these things. But, you know, they expected this injury to recur at any time again. 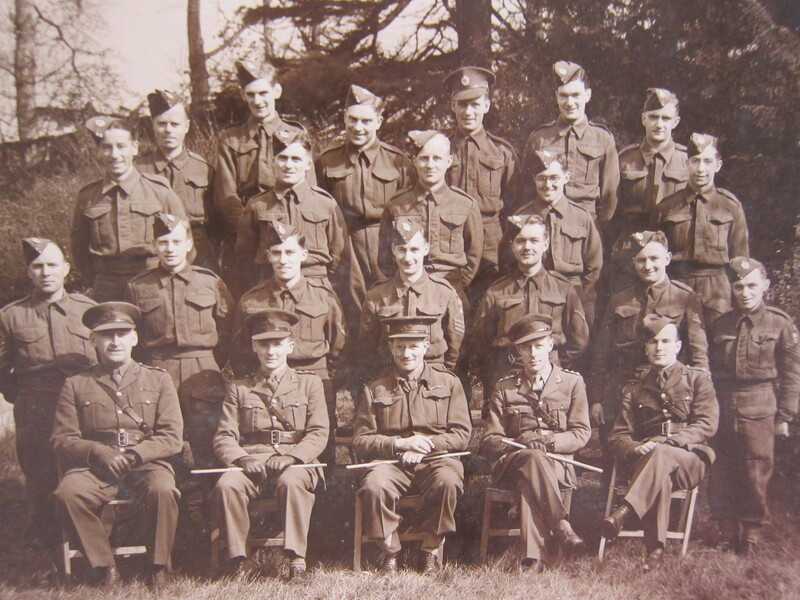 Henry (far right, top row) in the British Army Royal Engineers Regiment. 1939. And anyway, he coasted along with it ok, but they told him he might not be able to have children. Well, would you believe I told him that I was pregnant on his fiftieth birthday, so that was a nice surprise. Nobody was more surprised than the two of us! And, sure enough, nine months later I had this lovely boy, 9lbs 3, so I had to have a C-section. Baby was fine, but I was a bit rough for a year, but Henry used to do all sorts to help me. Unfortunately, when Philip was about four, Henry’s war injury had just got so bad he was wearing a support now, a leather and steel sort of support. They said they’d make a new man of him and do some surgery on his back. It all went wrong, and four days after the operation he was very, very ill. And he got over it, but instead of being in hospital for ten days he was in for three months, lost about three stone, and I brought him out in a wheelchair. And Philip used to help me get him into bed at night. I’d stand at one end, and Philip would lift up his dad’s feet and get him into bed. He did all sorts for his father and unfortunately because of Henry’s health, he didn’t have a dad who could play football or games with him. Henry, Philip, and Rita on Philip’s first birthday. 7 May 1971. Things were pretty sad at first, but he bore his injury with great dignity, and then he started to pick up again and he had always been a great artist. 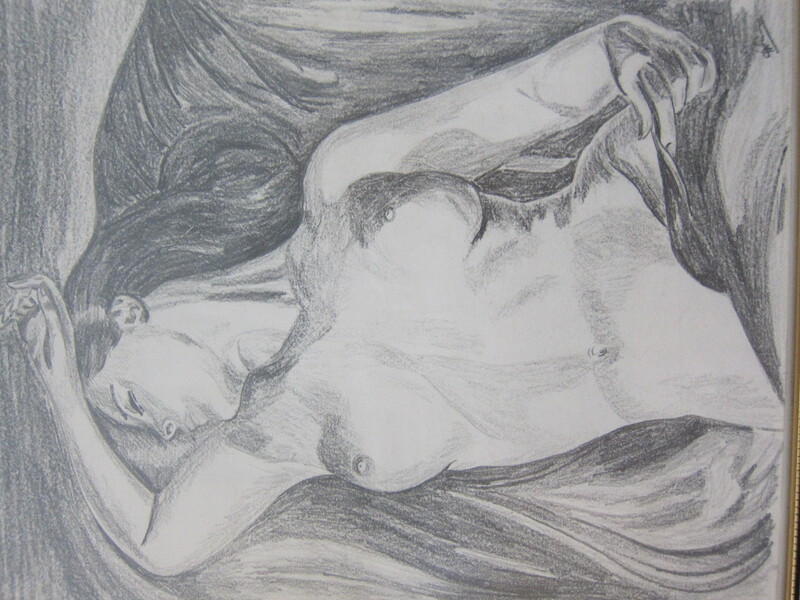 In 1939, September, he should have gone to the School of Art in Manchester but instead of that he was in the Army unfortunately, but those are some of the pictures that he’s drawn. He got awards from the Royals. Philip and I went [to London] to pick up an award from Princess Alexandra for that one. That’s called “Sleep”. We went and it was ages before she got ‘round to coming to us, and we were told, “Stay in groups of six and she will come ‘round and say hello to you”. Philip was getting a bit fed up, he was about ten, dressed in a velvet jacket with a dicky-bow, and he just said, “I’m fed up, I want to go!” and I said, “Stop being naughty!” So I called somebody and said, “We’re going because you know, he’s …”, and [they said,] “Oh you can’t go, she’s seen Philip and he’s the only child here, and she wants to meet him”, and I thought, “Oh my god what’s going to happen here”. So I said to Philip, “You have to bow to her”, and he said “I’m not bowing!” and I thought, “Oh my goodness”, and, anyway, she came over and she was talking to the lady next to me and then she just said, “Is he with you?” and I said, “I’m afraid so”, and I turned around and he was bowing like one of these nodding dogs, just doing this all the time. So she just had a talk to him, said “Why are you here?” And he made a speech. We hadn’t rehearsed anything, and he just told her, “I’m here because my Daddy can’t walk, so I’ve come to take his place”. I was just absolutely amazed. And then she said, “Did you say you came from Manchester, Philip?” And he said, “Yes, it was the Cup Final on Saturday”, and she said, “I know, I was there”. And he said, “It’s the replay on Thursday. Are you going to that?” And it was just lovely. She was really nice. And she said, “I’m sorry, I’m just having to go, but I’ve really enjoyed speaking to you”. And she said, “When you get home, tell your Daddy I send him many congratulations, and his picture is absolutely wonderful”, cos he’d won this prize. So, we came home, and Henry was in the kitchen making some chips, and Philip ran in and said, “The princess sent you a message”. Henry said, “Oh, I bet she did”, and I said, “Stop doing that, stop cooking those chips and just listen to your son”, and he told him everything that went on. And I was really proud of him that day. Henry two years before his death. C. 1996. Obviously Henry lost his job when he came out of hospital … couldn’t walk. They tried to get him going for about six months and then just said to him, “You’re taking the place of somebody who we can really help”, which was awful. The way we were dealt with at the hospital wasn’t very nice, but anyway determined as usual, I asked the British Legion for help because Henry’s war pension was very low at this stage. It was only 14%, and he was a man who couldn’t walk. It had never been adjusted. So, we had to go through all sorts. I remember we went to court one day in Manchester … what day would that be … about 1977 because not long afterwards both my parents died, so I remember that year. And they said they would consider his case, and he’d got to go here and got to go there, but in the end he couldn’t go anywhere because he was so poorly. Seven of them turned up to see him [at home] one day, and he was having a really bad day, wanted to cancel it, but I said, “No, this is how they should see you”, and they were only in ten minutes, and it was upgraded to a full Army pension straight away. And this made him feel better because he was supporting his own family again, albeit at first he thought it was something like charity, but I have to say the British Legion were fine with him and the pensions people were very nice. A lady used to visit him. Well, she was the one responsible for him starting drawing again because he used to just sit in that corner watching outside, but we had a very nice neighbour, an Italian lady, and she lived at the first house over there. When I was at work, I went back to work for British Airways, and when I was at work she would take him out in his wheelchair, whether he wanted to go or not. She’d take him out in all weathers, but she dropped the news she was going to live in South Africa where her daughter lived and where Philip and I had visited a few times.Henry’s first thought was, “Oh, no one to push my wheelchair now”, and he said “Well, that’s it. You’ll have to give up work now”. I said, “Well, no I can’t”. Because although he got the pension, my work paid for all the extra things: holidays and my car. So anyway, I said, “I’ve got a good idea. Let’s have one of these electric wheelchairs for you”. Now he couldn’t have a scooter because of his spine. He had to have a proper chair and, wouldn’t you know, they were very, very expensive. So, I asked British Legion for financial help and they said no. And I asked British Airways for financial help because they had a scheme, and they said no. So, he said “Oh well, that’s it”, and he was really down then, so I said, “We’ll ask the bank manager”. So I went to see the bank manager, and he said yes, but we had to pay about three times as much. But anyway, it was just amazing because, again, it gave him independence. But the first day he went out he just thought, “Oh, I just press this and press that”, but of course you had to get used to it. He took it on the main road, and I was seen running after him down the main road. “Where’s the brake? Where’s the brake?” But anyway, he soon got used to it and he was really well known round here. He went ‘round to the shops in it, and he used to chat to everybody, and it was a real lifesaver for him. I had to retire early because he was getting really sick, so I retired in 1966 and then I was obviously a full-time carer … No, not 1966. 1996 I retired, and Henry died two years later, in 1998. We came to live here about two years after we got married because in those days you couldn’t afford to buy houses, so when you got married you moved in with your parents, much like now. We lived with his mother for a few years and managed to save up a bit. It was in Longsight, on the border of Longsight and Levenshulme [Manchester]. But we weren’t very happy there. She was a bit difficult. 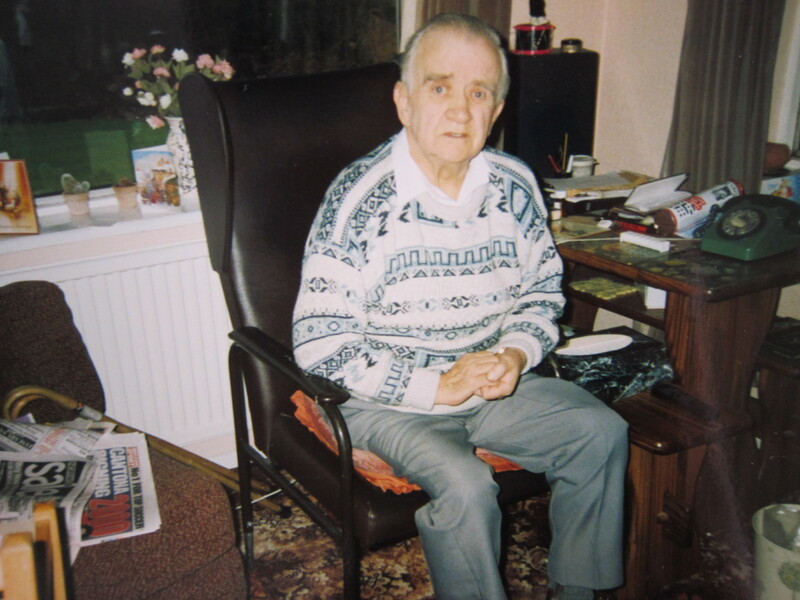 And then, after two years, we got on the bus one day, looking for somewhere to live, and a friend of Henry’s who he used to work with told him that they were building some bungalows in Cheadle Hulme, where this man lived. Of course, in those days it was miles away, but anyway we came to have a look. There it was [the house], just going up. It was just a pile of bricks. They were having a bit of a problem with building number three, because they wouldn’t let him pull some trees down, the builder. Anyway, in the end they didn’t build number 3 and we got two lots of land, which was lovely in those days because Henry was reasonably fit and he adored gardening so we had the best garden in the area. So, we’ve lived here since 1956 and been in this bungalow all this time. Did you have to make any adjustments to the bungalow? Yes, there was a wall here … because Philip needed a room, and Henry needed his own room, and initially I was sleeping on the couch. We decided if we had a loft conversion, and to do that, we had this wall taken out, and to do that, he could sit in his chair, a special chair, but he could get into his wheelchair, and wheel himself into the bedroom, or sometimes he had a walking frame, and if he was having a good day he could walk with that. But he couldn’t walk without callipers on his legs, so if there was any emergency during the night, he was stuck because it took an age to put these callipers on. He was going to the hospital about once a week because he was at risk of gangrene in his legs and feet, and he was diabetic. He had a heart attack, a stroke, all these illnesses came on because he was a sick man. I took him to the hospital once a week and they said he must look at the soles of his feet and investigate those every day, and he just couldn’t, so that was another job for me. I must have been talking about it at work with the engineers and they said, “We’ve got a surprise for you, a present”. And they presented me with an engine inspection mirror, which was like a mirror on the end of a flexi hose, which they used to put inside a 747 engine, with a little mirror on the end, checking for any cracks on the blades. And I took Henry in and said they want to present you with a little present, and he cried. He cried when he got that. Again, it was another bit of independence. The hospital thought it was wonderful, “Did you get that from a medical shop?” I said, “No, I got this from British Airways”. It’s a wonder we didn’t get the sack. I bet it was expensive, but they managed to get it out of stores for me and it was just great. It sounds like you had good support from your employer? Oh wonderful, from the airline. Any problems at home, he was all geared up with a little switchboard really, and he carried one of these alarms around his neck and any problems he just had to press that and it would alert me and it would alert the station in Stockport. They whizzed out and I would obviously ask for permission, and no matter what I was doing, I was just sent home. My boss had diabetes and he knew what it was like. The support was amazing, it really was. What about support from family and friends? Not a lot of support in those days. Not from the family. I had two brothers, but they lived the other side of Manchester, so we didn’t see a lot of them. 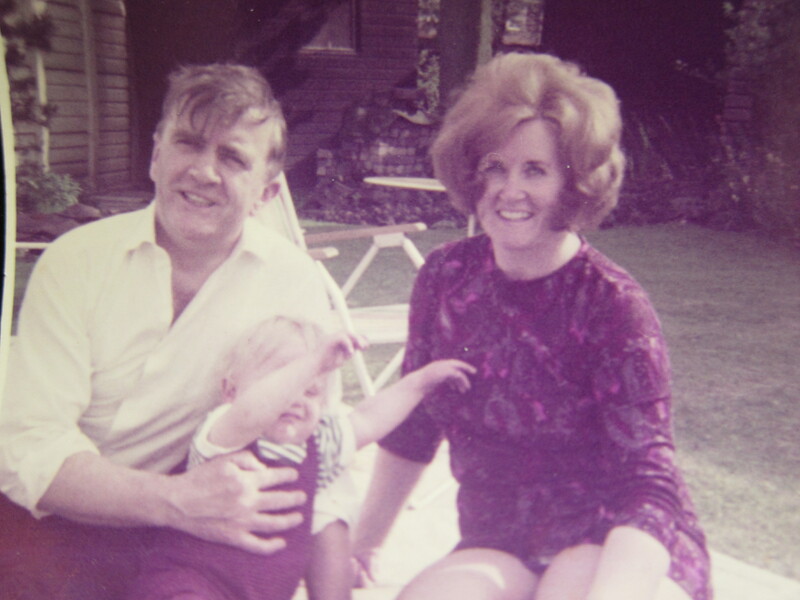 Mum and Dad died suddenly. Dad got knocked down by a car, and Mum died ten weeks afterwards, and that was only two years after Henry had all the surgery which had disabled him. So, I don’t really know how I got through those years. It was just because of all the support at work, and it took me out every day. I did have one or two breakdowns. I thought I was tough, but it just hits you. But anyway, medication, excellent doctors, my GP was absolutely excellent. I wasn’t very well after I had Philip. I was quite poorly, quite depressed for a long time with postnatal depression and wouldn’t tell anybody, typically. I had a most wonderful friend who was a nursing sister at Manchester [Airport]: Jean. She went back to Heathrow eventually, but we keep in touch and, in fact, we spoke yesterday, speak twice a week. An amazing lady, and she supported me very well. She stayed the first night I brought the baby home. “What do I do with this?”, feeling like death because I’d got all this surgery, and she just stayed with me overnight and looked after the baby, who was absolutely excellent. He was so good. If he hadn’t been good, I don’t know what I’d have done. She was amazing. We had friends, British Legion friends. They used to go in the Legion on Wednesday and Sunday. They’d pick Henry up, three of them, and he didn’t have much to drink because he couldn’t, but they’d take him and they’d bring him home, and you know it got him out of the four walls. Of course, I used to drive him all over the place because the cars I had, I always had a hatchback for the folding wheelchair, so I used to do all that for him. We went to Stockport one day, and he had a disabled badge, so we put that on [the car]. He had to get his eyes checked, and we came back to the car and there was a £30 fine because I wasn’t displaying the right paperwork. I really freaked out and told them to take the ticket back, and they said, “Oh we can’t once we’ve issued it, and we don’t know if your husband is really disabled”. I said, “He’s in a wheelchair”, and they said, “If the wheelchair had been in the car then …”. I said, “If the wheelchair had been in the car then I’m not pushing him, am I? !” Anyway, I dug my heels in again and said I’m not paying it, and all sorts of trouble, and then I found out the carpark was owned by the British Legion! That made it worse. And I started writing all over the place and it went to head office, and Henry was saying, “Oh let it go. Just pay it”. One day a really posh car pulled up, and he [Henry] was looking out the window. “What have you been doing now?”, he said. “Who’s this?” This man got out with a bottle of whiskey in one hand and a bouquet of flowers in the other. A chauffeur was driving. He came and knocked on the door. “Mrs Armin?”, he said. I said “Yes”. He was the most senior one at Preston, where the head office was. He said, “I don’t know how to apologise for this man. You say the word and I’ll sack him”. I said, “No, don’t sack him, but retrain him and don’t let him ever speak to anyone the way he spoke to my husband and myself that day”. So that was all, and obviously he gave us “whiskey for your husband and flowers for you”. And I said to Henry, “That was a good outcome, wasn’t it?” But things like that happen to people in wheelchairs. It sounds like you had to put a lot of energy and effort fighting your corner. I did. Because he was poorly and he couldn’t do it for himself, and he’d just have a negative outlook. But when he started doing his drawing again, he just changed. I had an exhibition for him one day, only in Cheadle Hulme, and there was a real artist having one in the premises the same day, and Henry was getting more [people] looking at his than this other man was. And this man said, “Who is this other bloke?”, and I said, “That’s my husband”. He’d done a lot of lovely drawings, of Marilyn Monroe, film stars with nice features, like Charlie Chaplin, and he’d got all these pictures he’d done and he was selling them like hot cakes. He was charging about £20, and I said, “You could charge more than that”. Anyway, one man came up to him and said he was an art dealer and he was very impressed. Apparently, hands are difficult to do and Henry had done a drawing … I’ve not got it [here] now … It was just a pair of hands. I’m trying to think, it was on another picture, and he’d taken it from another picture. He was so impressed, and he wanted him to do a big picture, and he came all the way from Blackpool. But as soon as there was any pressure, he wouldn’t do it. “No, I’m not doing that”. He just wanted to do it for his own pleasure. He did that one as well, over there, which is taken from that painting [statue]. I think it’s called ‘Petra’ or something. That’s in Rome anyway, that right-hand one. Anyway, that was a good day. How did Henry take up drawing again? Mainly because of one the ladies who used to visit him from the pensions people. She was called the handicraft lady or something. In fact, those pensions ladies were just wonderful. He had a welfare officer as well, who was pretty good. I got a phone call one day saying, “My name is such-a-thing and we were talking in the office and we don’t think you’re being looked after properly, Rita. We know how poorly Henry is, but if anything happened to him, you would not get a War Widows’ Pension”. Because in those days you had to be in receipt of a Constant Care Allowance, and I wasn’t getting that. I didn’t know about it. The Welfare Officer never told me, but these ladies in the office, who very often know more than the boss, they said if you get that… we think you should apply for that. I said, “Well, I didn’t even know about it”. So that when he did die, there was no pressure, everything just went really well, if you can say that. The funeral was paid for and my pension started immediately [when] Henry’s finished. You know, a good pension that is now tax-free thanks to the wonderful ladies of the War Widows’ Association, and that means a lot. Although I get pensions from British Airways, I don’t get a state pension, even though I paid for that all my working life, because you can’t get two pensions, so I get my War Widows’ Pension, which is tax-free, and that means a lot because it enables me to have a comfortable life and also help my family. I’ve got some photographs here of Philip’s wedding. That was a wonderful day. That was in 1994, so Henry was still around then. That was absolutely amazing. Philp has been a good son and he’s good to me. He only lives about five minutes away and he’s hopefully coming to fix the fence today. He’s got three boys, Sam, 21, Josh, 20, and Joe, 15, and they all look like grandad. That photo where I’ve got a big hat on, that [Henry] is the image of my son and that’s his dad at my son’s age now. He’s just the image of him. That’s my mum on the left-hand side. I think it’s before we had Philip. I think I was about 30, so it must have been about 1963 because I was born in ‘33. It was a cousin’s wedding, a cousin who is a doctor in Liverpool actually. That photograph in the front, that’s Henry on the left-hand side, and that’s his brother who was in the Medical Corps and they’ve got World War 1 uniforms on there because they didn’t have any World War 2 uniforms. They used to parade with brushes and they had cardboard tanks in the background. Things weren’t good at all at the beginning of World War 2. Did Henry’s brother come back from the war? He did. He was in the Medical Corps because he worked at the [Royal] Eye Hospital in Manchester, so obviously he was interested in things medical, and his Colonel or Captain was a doctor, and he saw in John something, and he became a doctor, but not a medical doctor. He worked for the Medical Research Association and he worked at Guy’s Hospital [London] for quite a long time, and then he got fed up of the rat race in London and just went farming in Wales. He did very well because of his medical knowledge. His cows were the best in the area. And the boss of all the cows, there’s always one leader, she was called Rita. And when he used to go milking, he used to put The Archers [radio programme] on and they’d all be swinging their tails. He had this lovely farm. You mentioned you are involved in the War Widows’ Association. Can you tell us how you became involved with that? Well, I didn’t even know about the Association until after Henry died, and the first thing I knew was when I got my first Courage [WWA newsletter], and I thought, “What’s this?” Obviously, there were various numbers in it, and I rang up and spoke to various people and carried on getting Courage. And in 2005, I was chosen to go across the arena in the Royal Albert Hall with this wonderful lady, Phyllis, who is in the magazine. I went to Birmingham or Wolverhampton to see her and she’d died by the time I got there but the two of us were side by side [in London]. There were nine of us and we trained for three days with the Marines Oh, we had some fun. And then we had to walk down the steps going down into the Royal Albert Hall arena and then walk across the arena. It was just an amazing experience. They put us up in a lovely hotel. I got that. I applied through the War Widows’ [Association], but they didn’t choose me. You were chosen by the Royal British Legion. They’re a wonderful association. Tell us a little bit about the British Legion and what they’ve done for you. All the time we were fighting for pensions, we had a particularly good representative in this area and they’re all volunteers, of course. This gentleman, I knew him through the airport, he was a director at the airport, and he’d come ‘round here and dictate letters to me, and I’d be sending them all over the place and getting interviews for Henry, and going to court appearances, and what have you. I said to this gentleman, when we went to this one that was a pretty important one where … well he didn’t get his 100% there but he certainly got more than what he’d been getting … and I said to him, “Are you coming with us?” He said, “I’m not allowed. I’m not allowed to go in that court. I don’t even know what happens”. I said, “If I get permission from whoever there to make notes in shorthand and give you all the minutes afterwards, do you think that would help for future cases?” And he said, “That would be amazing. They might not let you do it”. I said, “I’m not going to mess about, I’ll ask them”. And they said, “Oh, certainly”. And they wouldn’t let him come in, but they would let me take all these [notes], so I did a full verbatim thing, and he said, “This is amazing. This will really help for future cases”. We had a British Legion that was just on this main road here until a couple of years ago, and they knocked it down and built a load of houses, and people were so upset about it, so upset, because there was a time when people weren’t going in as much, but it had gotten better again, and it was so good for the retired servicemen, and even the young ones. When they came home they went in there. And Henry used to go there twice a week with three other lads who’d all been in the [Armed] Forces. Every Remembrance Sunday, he would march with them and he would parade at the Royal British Legion and then they’d go to the Cenotaph on the other side of Cheadle Hulme and have a brass band and all the rest of it. Of course, when he couldn’t walk he said, “I can’t go”, and I said “Of course you can!”, and I pushed him. And then when he wasn’t fit to be pushed, they would have the service at a different church every year, and I’d find out where the church was, and I’d be in the front row with his wheelchair, and he was still part of it. Then the last two years he just wasn’t fit to go, and he was crying. He was upset and said, “Will you go and will you wear my medals?” So I did, and I’ve done it ever since for nineteen years, and I will do it until the day I die. But you’ve just got to be strong. It’s no use weeping, and I weep when I’m alone. I don’t weep in front of other people. And you can be lonely, but you just got to get out and do stuff. I’m fortunate in that I do find it easy to talk, as you probably notice. I’m outgoing and I get that from my background, I think, because I had this grandmother who was just wonderful, Nellie. She was the one who was concerned that her son couldn’t swim and he’d gone all the way to the Falklands. I think I was poorly, this November just gone, I wasn’t very well and my son went, and Joe wears that little medal on its own there, my youngest grandson. Also, would you believe, the police take me now because they put a wreath on. When I first started with the police, I said to Joe, “Do you want to come with me and wear one of Grandad’s medals?” And he said, “Oh, I don’t know”, and I said, “We’re going to collect you in a police car”, and that was different. So we turned up for him and he looked really smart with his medal on. We took him in … the old-fashioned name was the Black Maria, the one they used to put the prisoners in with the cage in the back, and they said they were going to put them in the cage, but we didn’t let them because they’d been out Saturday night and it wasn’t very nice in there. I’ve had some lovely photographs taken at the Cenotaph with the various PCs when it’s been their turn to put the wreath on, and Joe has been there with me and gone up when I’ve put a war widows’ wreath on. I do that every Remembrance Sunday, or sometimes I would go to London instead, and that’s a wonderful experience, and walk with the war widows there. But the secret is to keep busy. You can do your weeping on your own, but just do other stuff. I just feel that I help in the community by this police work, and I certainly helped when I worked at the hospital. One day I went on duty there, I used to wear a nice uniform there, a Red Cross uniform, and the Sister sent for me. We were all giggling, and I thought I was in for a telling off. I said, “I’m ever so sorry. Am I on the carpet for making noise?” She said “No. Just to say I always know when you’re in, Rita, because everybody laughs. I can hear everybody laughing”. And the ladies [patients] would always say, when you’d walk in, “Here’s one who is not going to stick a needle in us”. Oh, it was lovely I really enjoyed working in the [Christie] Hospital. Respondent correction: Aircraft. Instead of four engines. Respondent correction: One of my main jobs. This interview transcript, its print and online versions, and the corresponding audio files are published under a Creative Commons Attribution-NoDerivatives Licence. This license allows for redistribution, commercial and non-commercial, as long as the work in question is passed along unchanged and in whole, with credit to War Widows Stories. If you wish to use this work in ways not covered under this licence, you must request permission. To do so, and for any other questions about this interview, how you may use it, or about the project, please contact Dr Nadine Muller via email (info@warwidowsstories.org.uk), or by post at the following addressing: John Foster Building, Liverpool John Moores University, 80-98 Mount Pleasant, Liverpool, L3 5UZ.